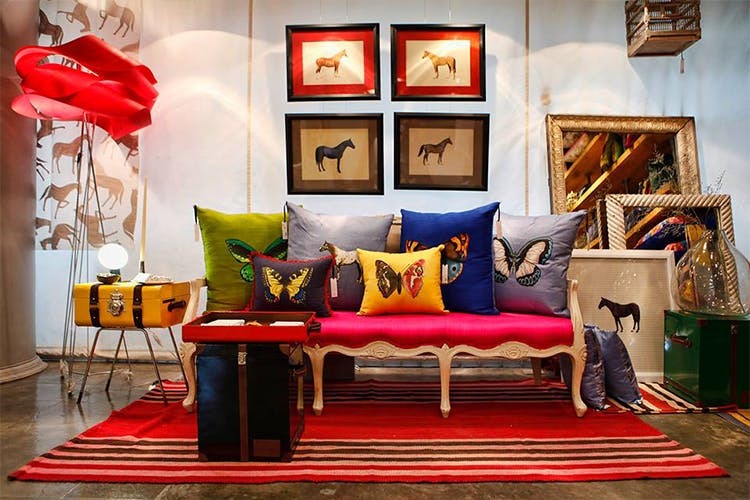 Did You Know About This Quirky Home Decor Store In The Middle Of Shahpur Jat? If you’re out and about in Shahpur Jat, you may want to give yourself a break from all the shaadi shopping and check out some décor at Second Floor Studio. Right outside Dada Jungi House, this store stands tall and pretty and the interiors stay true to the first impression. We believe it’s one of the few home décor stores in Shahpur Jat and it displays some really unique finds. Most of their products are quite eclectic and random and they cater to your décor, clothing, bags and accessories needs. They have various brands like Nappa Dori, Pero and Oliva Dar to name a few and they definitely do great justice to the products displayed. We loved looking around their store. They can’t be singled out as just selling clothes or décor. Their varied collection of different items makes this store a haunt for picking and choosing different things. We love their hand painted cushions. They looked classy and beautiful and would stand out on any couch they’re displayed on. They have some quirky furniture you can show-off in your living room and some small funky knick-knacks like candle stands, photo frames, crockery you can absolutely drool over. Their clothing line looks rather summery and fun. We loved their tunics in all shades of white and their hand-printed stoles stole our hearts. This space is a mélange of interesting home décor objects and if you’re looking around for random yet fun stuff to do up your home with, definitely check this store out.